Immediately following a busy 2003 calendar, Linkin Park launched into a full scale global assault fueled by the release of Meteora the previous year. 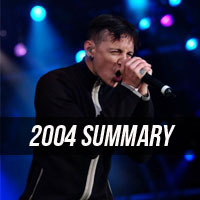 With 77 scheduled appearances taking them from the US to Canada to Europe to Asia back to the US and finally to South America, 2004 was a jam packed year for the band. The Meteora World Tour began in January and featured Hoobastank, P.O.D. and Story Of The Year, with members of each band routinely joining LP on stage at the end of the show to help out on "One Step Closer". This is also the period where the band began bringing fans on stage to play Brad's guitar part on "Faint". The setlist for this tour remained roughly the same as the UK Fall Tour in late 2003, but with "With You" and "Runaway" opening the show once again. This is arguably the band's most successful tour in their touring history. In the month following the US tour, Linkin Park would play 9 dates taking them quickly through Europe and Southeast Asia, highlighted by their appearance at Rock am Ring. The TV broadcast of the full show has favorably been compared to the band's official release from the same period Live In Texas with many fans proclaiming the Rock am Ring performance the superior of the two. It was at this time that Linkin Park decided to change up their live setlist once again. "Don't Stay" featured a brand new, full-band intro with part of 'Gacela of the Dark Death' by Joan Baez mashed up with it. A new "Hip-Hop Medley" (as it was proclaimed by fans) featured portions of "Step Up", "Nobody's Listening", and "It's Goin' Down" all mashed together into one song. To cap it off, LP played their first cover song in almost two and a half years when they added "Wish" by Nine Inch Nails to their encore. Upon their return stateside in July, the band would surprise fans with an announcement of an intimate live show at the Roxy in Los Angeles. This was the culmination of collaboration with a music legend - Shawn Carter, better known as Jay-Z. The performance from that night would be documented with the release of the mash-up album Collision Course four months later. The Projekt Revolution Tour followed shortly thereafter and featured a diverse group of bands on the bill: Korn, Snoop Dogg, The Used, Less Than Jake, Funeral For A Friend and No Warning among others. This tour had a few small changes from Europe and Southeast Asia - "Figure.09" and "From The Inside" were joined by a brand new full-band jam transition that instantly became a fan favorite. "Breaking The Habit" and "Numb" featured the same treatment, making the setlist flow incredibly well and become arguably the best set the band has ever presented on a live stage. Adding Bert McCracken to "Faint" and Jonathan Davis to "One Step Closer" each night, Linkin Park was a force to be reckoned with in regards to their live shows at this point in their career. The touring cycle culminated in Sao Paulo, Brazil and one of the largest crowds the band would play in front of, with 60,000+ fans packing the stadium. This would end the band's two years worth of travels and signal the beginning of the band's time writing their third album. The Meteora touring cycle has been quoted by the band as making them very tired, perhaps contributing significantly to the two year "hiatus" of the band from touring. 2004.02.06 Inglewood - Reason: Chester had bronchitis and acute laryngitis. Rescheduled for the end of the tour. 2004.06.11 Wiener Neustadt - Reason: Band pulled out of the festival for an unknown reason. The end of the Meteora World Tour was rerouted several times; we have included the dates on the year page. This page was last edited on 28 March 2019, at 15:46.